Come and relax in this beautiful 1600 sq. ft. log cabin, which is located on the edge of the Challis Chipmunk Ski Hill. 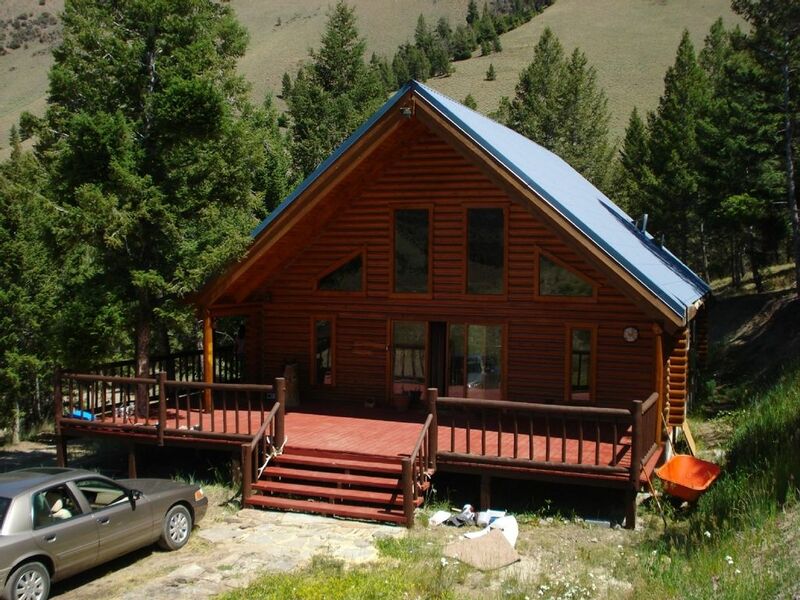 This home is located just 8 minutes above Challis and has easy access to hunting, fishing and ATV trails! The cabin is very quiet and secluded. You see wild game often from the cabin. We also have a bungalow just outside the rental cabin that can also be rented. The bungalow has a queen bed and sitting area with a bathroom. If you would like to rent this along with the rental cabin, mention this to the owners. The cabin is very secluded and peaceful. Winter Conditions: During the months of November - March, a four-wheel drive vehicle is a must to drive 3/4 of a mile up to the cabin. We keep the road plowed, but it is fairly steep and can be slick. It is not dangerous, just slick. We, Mark and Barb Needs, are pleased to offer this cabin for rent. When we purchased the property, it had 2 cabins on it - one finished, one not. We have since finished the one and it has become our personal cabin. We then decided to rent out the second cabin. You cannot see between the cabins. There are no neighbors - except if we happen to be up to our cabin. You are totally alone in the mountains. If you have any questions, please do not hesitate to call or email us. Thank you and may the Lord bless. We chose to buy in this area because we love the area. Mark loves to hunt, fish and watch wildlife as do our children. We bought it for our own personal use. Then when we finished the second cabin, we decided to rent out the first one. We love the quiet mountain area and the fresh clean air. When you stay in the NN Cabin, you are in the mountains, yet not too far from town. It feels like you are 100 miles from anywhere, but the golf course is just 8 miles away. The areas to hike and explore are endless. It is very very quiet and secluded. Lovely spacious cabin in the mountains. Lot's of room with comfortable beds for our family of 7 plus the best water ever. Quiet and beautiful views. Mark was very accommodating and we had everything we needed. I would highly recommend this property. This property is beautiful and amazing. We had a fantastic time. The Best Place for us! We loved our stay in this beautiful cabin! This was a wonderful cabin to come back to after a long day of trail riding. The cabin and views were so beautiful, I almost hated to leave. This place is absolutely beautiful, peaceful, relaxing..... we had an amazing time exploring the endless nearby trails on a 4-wheeler we rented from Mackay (Top of Idaho). The cabin is very clean and well maintained. It was a pleasure working with the owners - very friendly and helpful! Thank you for the best vacation place ever! We are so thankful that your time was good. We enjoyed working with you also. This cabin and it's accomodations made our annual sister trip even more special. Lot's of room, and the kitchen is very well equipped. It was perfect for us, and if possible, we will be back next year. Thanks for the great review. Our goal is for our guests to have a wonderful time.